In house training offers a variety of different benefits for you and your company. From increasing productivity within your team to giving your staff and employees the best and most competitive tools and skills to perform their jobs, the benefits you can reap are endless. However, how can you improve your in house training in order to optimize these benefits? 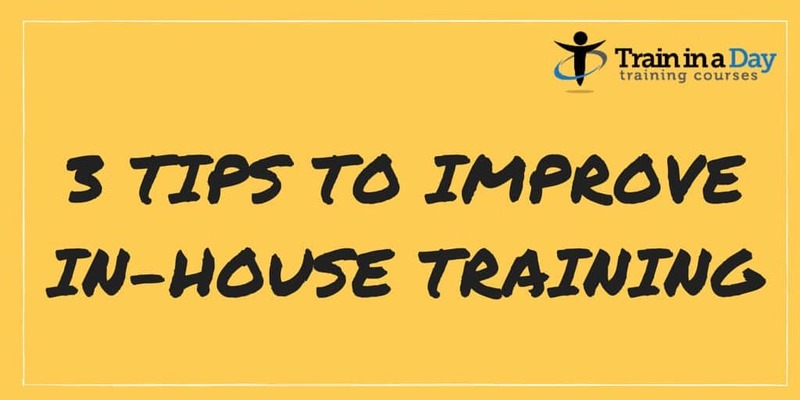 Here are three simple tips on how to quickly improve your in house training. One age old saying that still applies very aptly to not only life in general, but more specifically to business is, “Time is money”. Managing your time and your employees’ time is an important facet of your training’s success. Utilize the time you have together effectively, minimize any dawdling or awkward transition periods by being prepared. Everything presented, including activities and discussions, should be tailored to achieving one of two goals, if not both: educate and/or build your team. Schedule your trainings more frequently in order to ensure constant team building and give small bits of information rather than overloading employees. By doing regular and sporadic training, employees have time to utilize and practice skills learned in training sessions between the next, allowing for a constant growth process to occur. Additionally, more frequent and shorter training allows for the team to continue to learn how to cooperate and build upon their previous team building exercises. Include your managers and other highly ranked individuals into your training. First off, it will provide a greater buy in from the larger population of your staff. Secondly, it can also help enhance the skills of those who are helping run and manage the company on a day to day basis. In order to remain competitive in today’s economy, it is important to have top tier workers from the bottom to the top. It is psychologically proven more people are motivated by the carrot than the stick. Hopefully, you have fostered an environment within your business that encourages a culture of learning. However, a little extra incentive never hurt anyone. Rewarding progress can motivate many of your employees even further than what is most likely a great intrinsic motivation. If they know that they have the potential of earning some extra reward on top of continually improving their skillsets to remain a competitively marketable part of the workforce, they will most likely welcome and embrace new training concepts quickly without anymore qualms or complaints. A little competition never hurt anybody. With those three tips, and our complete guide, you can take your in house training to a new level of success. Not only are they extraordinarily effective, they are quick and easy to implement. These easy tips can leave you with a booming and successful business, competitive staff, and increased productivity — so what are you waiting for?